This simple cartoon cow is very easy to make and you are going to love the end result! 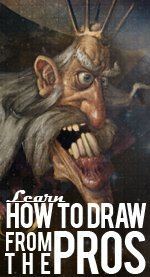 Get your drawing tools and keep reading below. Make a big circle and then a smaller one a little up and to the side of the big circle. It should be obvious, but just in case it isn't, the big circle will make the cow's body and the smaller circle will be used to make the head. Next, draw two small straight lines down from the sides of the smaller head circle and then curve them slightly at the bottom and join them as shown on the example to create the jaw of the cow. Next, go towards the upper portion of the small circle and make two little semi ovals on both sides of the smaller circle to form the ears of the cartoon cow. You should start to be able to see the shape of the head coming to life now. In this step you'll add a straight line coming down from below the jaw to make the front legs. As this line moves downward past the bottom of the larger circle for the body it will curve up slightly in the end, then joins a small horizontal line, and then we make a small “v” which joins the big circle of the body. It sounds more complex than it really is – just follow the visual example as shown regarding the size and the shape to get things looking good. In this step we have made the two little front legs of the cow!! Next you will move to making the hind legs by adding one small “v” and then a little bigger “v” which then joins the centre/side part of the big circle. The hind legs are done and now you can see the shape of the cartoon cow's body emerge! In this step you'll want to remove all the extra lines of the cow's body as shown in the example. After you've cleaned up the lines add two small ovals for the eyes and two narrow ovals for the cheeks. Next, draw one little bigger oval below the middle jaw which will be the bell of the cartoon cow. To make the horns, just add two more slightly rounded and upside down “V” shapes on top of the cow's head. In this step you'll add a little curving line on the other side of the cow for the little tail with the rounded tip of hair. Then add all the black spots that the cow has. There's one as a big eye patch - covering one of the eyes, while there is another black spot near the tail, and one smaller one near the hind leg. Finish up by adding another yet smaller oval in the centre of the cow's body for another little black patch. Take a look at the example sketch for the reference of all the black spots on the cartoon cow. That's it – your cow drawing is all finished!